Close to Edinburgh International Conference Centre. NCP car park 50 metres away. 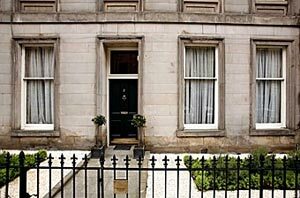 Guests from all over the world have happy memories of staying in the heart of Edinburgh at the fin-de-siecle ground floor apartment of 2 Cambridge Street (a.k.a. The Dynamite Club). 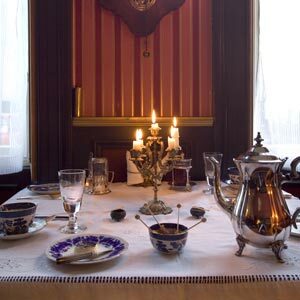 Hélène (teacher) and Erlend (journalist) have created two very atmospheric guest suites; breakfasts are inimitable and delicious. 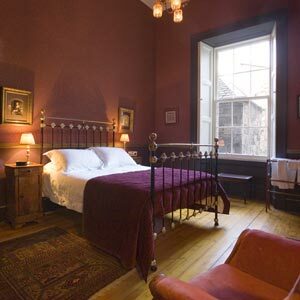 The Usher Concert Hall, Royal Lyceum Theatre and Traverse Theatre are within 50 paces, Princes Street is a couple of hundred yards away and Edinburgh Castle looms above the end of the street - surely this is one of the most central and convenient bed and breakfasts you can find in Edinburgh. 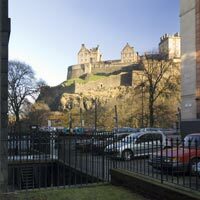 Right; View of Edinburgh Castle from the Cloustons' doorstep. 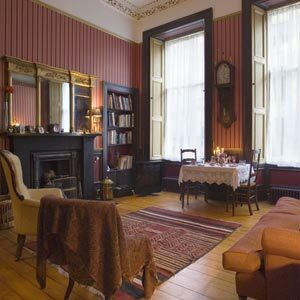 In keeping with the date of the building the style is mid-Victorian: romantic rich reds, warm honey-coloured pine floor, brass bed and rococco flourishes. 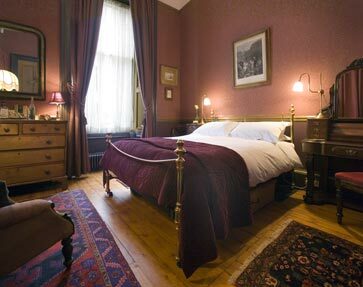 The Double Bedroom is at the back of the house overlooking the gardens and has an adjacent private shower-room separated by two doors. 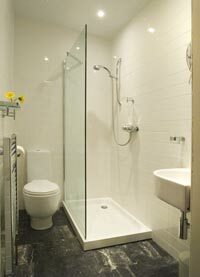 Shower-room for the Double Bedroom above, with power shower, basin and wc. 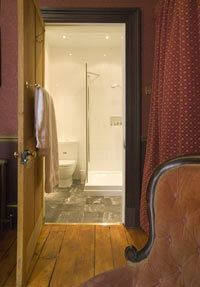 Double Bedroom at the front of the house with its own shower room (power shower, basin and wc) en suite. Savour dreamy, candlelit, breakfasts with fresh pomegranate juice and caviar-kissed soft-boiled eggs while serenaded by Chopin Nocturnes. Breakfast menus can include Pommes Rimbaud, Mushroom Taleggio, and the tongue-tingling Havana Banana (as christened by the daughter of the last president of Cuba). 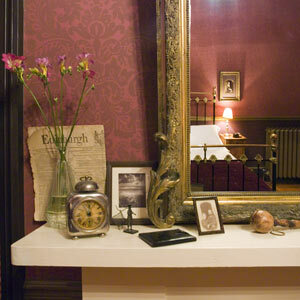 French and Spanish are spoken fluently at 2 Cambridge Street B&B. There is Wi-Fi internet broadband for your laptop. 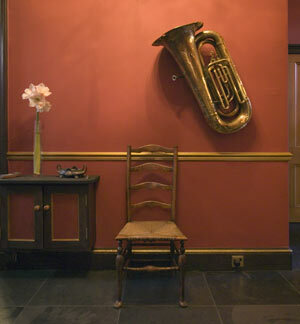 A chair in the hall. Q: Which Scottish lawyer did Mark Twain blame for starting the US Civil War? See: Erlend's article about the mountain wilderness in the middle of Edinburgh, Arthur's Seat. Please tell Hélène and Erlend you found 2 Cambridge Street through About Scotland!